Students are taught what an effective lesson looks like. 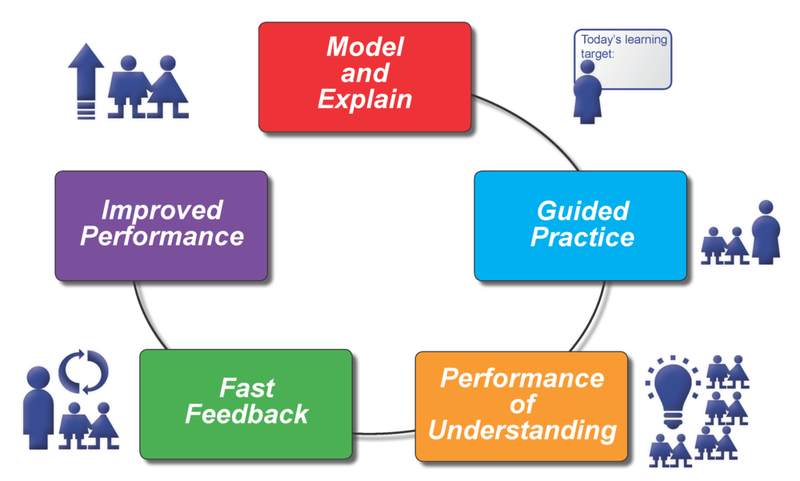 A coherent instructional framework brings consistency to teacher and student practice. A skilled teacher whose lessons generally look like the image to the left will maximise learning for students. They give direct instruction including making clear what the learning target is and what success will look like, they get students working and practising, they build towards a performance of understanding where students know they will do, say, write perform or make something to help learning and to assess learning so far, they get fast feedback on the spot and they get a golden second chance to attempt similar work after that feedback. This process may take place entirely in one lesson or over a series of lessons. When we teach students what an effective lesson looks like, we’re telling them what they deserve and what they should get. We’re letting them know that we do it as a team and that their roles as learners, supporters of other learners and supporters of the work of teachers is crucial. Students are given a voice through the asking and answering of questions about the effectiveness of elements of lessons. Classroom surveys and on-the-spot review allows classes to plan for improvement. I know what the learning target is for the lesson. I know what I will be able to do when I finish the lesson. My teacher explains the learning target, the work that I am expected to do and what quality work will look like. There is a focus on building up to a 'performance of understanding', where I am asked to do, say, write, make or perform something that helps me to learn. I get the opportunity to practise and prepare before I am asked to do, say, write, make or perform something that helps me to learn. I get fast feedback about what I did well and what I should do next to improve the quality of my work. I get the opportunity to try again and improve my performance. I assess my own work by comparing it to high quality work my teacher shows me or describes to me.